Cleavers is rich in vitamins and minerals, and contains flavonoids, coumarins and various alkaloids. It has strong affinities to the lymphatics, kidneys and nervous system. Cleavers is a gift to the lymphatic system, supporting the movement of lymph fluids and easing congestion of swollen glands. It is an excellent herb to reach for when getting a cold and for elimination support and skin issues of all varieties. The lymph system is a complex network of fluid-filled glands, nodes, ducts and vessels that transport the waste away from our tissues and neutralize it. We have internally produced toxins (from natural processes in our bodies) and external toxins from foods or air pollution. The lymph system can become congested or sluggish and herbs such as cleavers can help clear this up. In addition, cleavers is one of the most effective diuretic blood purifiers known. The stems, leaves and flowers should be tinctured fresh in vodka. With fresh cleavers, use as high proof alcohol as you can due to the high water content. While dried cleavers will still be rich in vitamins and minerals, the lymphatic and diuretic properties don’t hold up well under drying. For dried cleavers, care should be taken to dry the plant quickly. Cut the stalks into small pieces and fill a jar with the stems, stalks and flowers and cover with alcohol. Cover and label the jar. Strain the tincture in about 4 – 6 weeks. 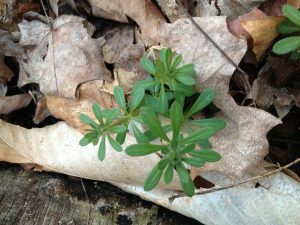 Cleavers is also a nice edible and can be added to soups or eaten raw in a salad.